California attorney Svitlana Sangary advertises her services on a website plastered with pictures of herself smiling with her celebrity friends. Only she was never actually in the same place as her celebrity friends; all of the photos are 'shopped. Expertly, I might add. 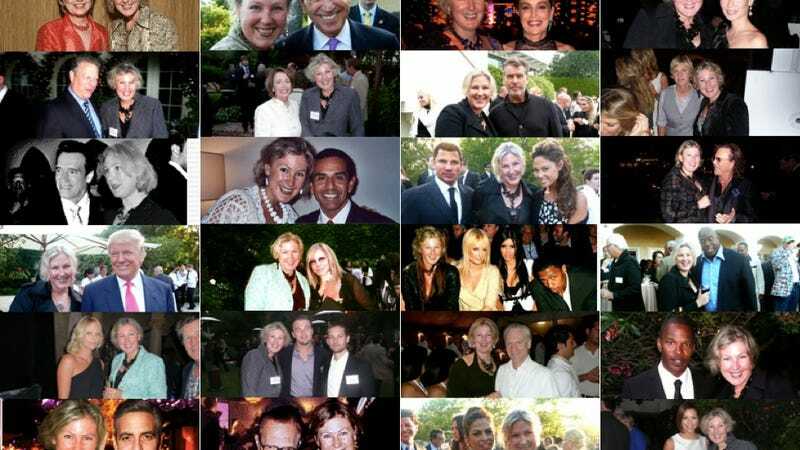 Sangary's site – which is still up in case you want to marvel at her photoshopping skills – features dozens of photos of her and celebrities such as Anne Hathaway, President Barack Obama, Kim Kardashian, Lucy Liu, Sharon Stone, Paris Hilton, Hillary Clinton not looking at the camera, and James Gandolfini looking lost. Gawker's resident image wizard Jim Cooke offered his accolades to Sangary's skills. The lighting is right, the scaling is good. She's better than most. Unfortunately, in the state of California, 'shopping yourself into pictures with celebrities you've never actually met in an attempt to drum up business constitutes false advertising, and it got her a 6 month suspension from the Bar.